There are many ways to pay your rent to Coastline. In My Coastline you can click through to our payments handler allpay which accepts debit or credit cards. allpay will ask you to register on your first visit. For this you will need the 19 digit Payment Reference Number (PRN) from your Coastline payment card. Please contact us if you do not have a Coastline payment card. Our Customer Access Team will be able to give you the Payment Reference Number. 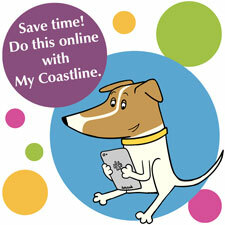 Download our free Coastline Housing App to make payments from your Apple or Android device. The Coastline Housing App featurees all the benefits of My Coastline and uses the same login details. If you have a bank or building society account, Direct Debit is a quick, efficient and secure way to pay your rent. Payments can be taken regularly on any days of the month to suit you - weekly, fortnightly, four weekly or monthly. To set up a Direct Debit please call and ask to speak with your income manager, or send a message using the quick contact form to the right so we can phone you back. We will write to confirm the Direct Debit is set up and what your payments will be at least ten days before the first one is taken. If there are any changes to your rent or your housing benefit we will automatically adjust your payments and tell you in writing. With your Coastline payment card you can pay at any Post Office using cash, cheques, credit cards and debit cards. At convenience stores with a PayPoint machine you can pay with cash. You do not have to fill in any forms. Just give your Coastline payment card to the cashier and tell them how much you want to pay. You will receive a receipt. The cashier cannot see your rent account. Your privacy is protected at all times. If you lose your Coastline payment card simply send us a message to request another one. Your new card will usually arrive within a week. Please do not use your card at a PayZONE machine as your payment will not be allocated to your account. Call our usual number then press option one to make a payment 24 hours a day. Payments can be made using any debit or credit card. Have your Coastline payment card to hand.